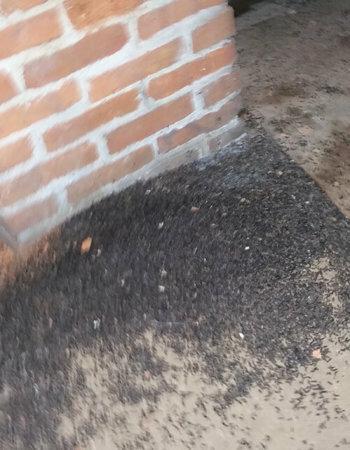 We don’t always recommend guano cleanup for our clients that have recently undergone a bat removal. We take guano cleanup on a case by case basis. Of course, the most obvious question is why. Why do we not always recommend you cleanup bat guano and urine? Trust us, we get it. Guano is gross. We have a lot of clients that we’ve flat out told, “cleanup isn’t necessary” that still hire us to do guano cleanup. They just don’t want to leave it. 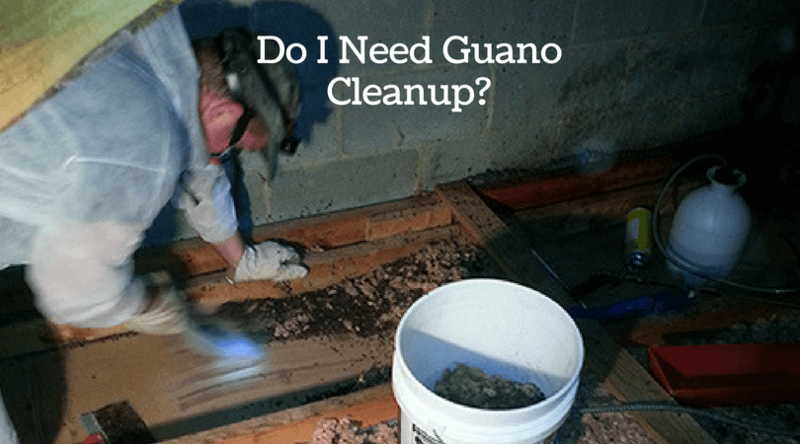 So, under what circumstances does guano absolutely need to be cleaned up? When it is in an area that needs to be accessed regularly. If you have bats that have made a mess all over your seasonal decorations stored in the attic and you want to be able to take them out and put other storage items in there, leaving the guano is a bad idea. Bat guano is dangerous in the right circumstances when disturbed. When there is an odor. Trust us on this, you will know when you have a bat odor. They can only be described as pungent. When the guano is in a sealed area such as a wall cavity or inaccessible attic space. There is no risk of it being disturbed unless you start tearing down walls or ceilings. 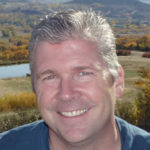 And even in those circumstances, it is most likely that you will do that years down the road after the guano has dried out and no longer poses a threat. When there is scattered guano and no piles. You really don’t need to go through the expense of hiring a professional guano cleanup specialist. Get a good shop vac with a hepa filter, use a respirator (something better than a dust mask), and vacuum it up. Trust us, you will save yourself money even if you have to go buy the vacuum. When you have a log home and it is scattered in between the beams. This guano will fall out naturally on its own. While it may be gross to find some scattered guano on the floor after a windstorm, it is safe to again just vacuum up. In reality, most of the time guano cleanup comes down to a comfort level. If you absolutely don’t want it around and there’s no odor issues, hire us to clean it up. If there are piles of guano, you definitely want to hire us to clean it up. But the nice thing is, we’ll tell you honestly whether you NEED it or not. If you just want us to assess the situation and tell you what you’re up against, give us a call. We’ll discuss it and review pictures for no charge. We don’t want you to live with uncertainty, but we also don’t want you scammed by someone telling you it has to be done. Hello Melissa, Every bat infestation is different so there isn't a set rule, it's a case by case. Our customer service department would be happy to get more details and help you determine if you can leave the guano alone or not. Please feel free to call and have a consultation. 877-264-2287.